For two people who really enjoy eating tomato sauce, I knew it was only a matter of time before we began to make our own. Coupled with a new-found desire to eat natural foods and stay away from unknown ingredients/chemicals and the fact that homemade things just tastes better than store bought, we ventured down the path of creating our own marinara. 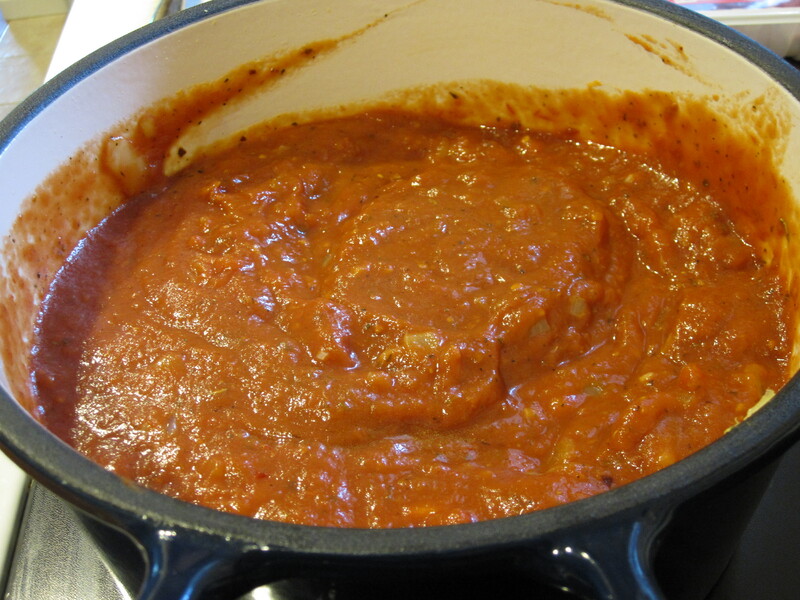 We created a very basic marinara, which leaves a lot of room for creativity going forward. For now though, it was a few simple ingredients simmering in low heat for all of a Sunday afternoon that stole the show. I started the sauce off with some chopped onions and carrots (which, in retrospect I probably should have grated the carrots) and of course, a good amount of garlic. 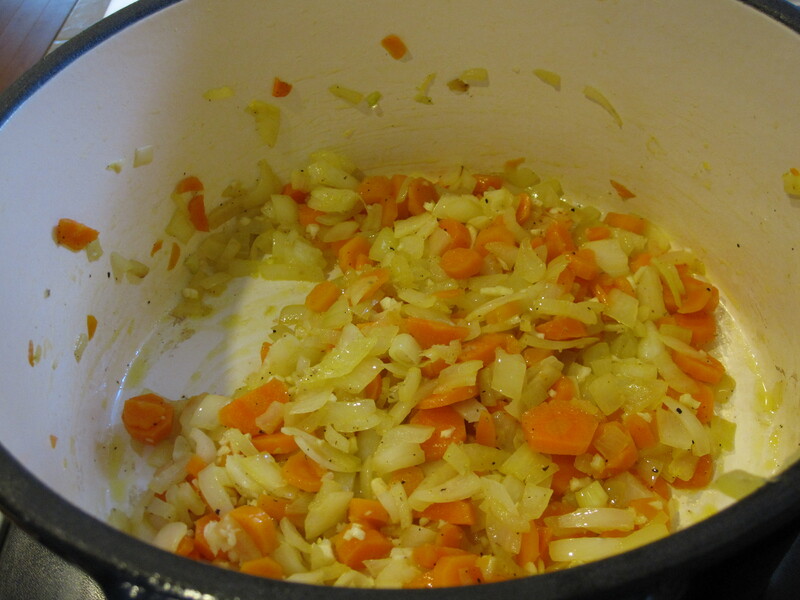 I sauteed all of these ingredients (carrots and onions first, then garlic) in extra virgin olive oil in the dutch oven. 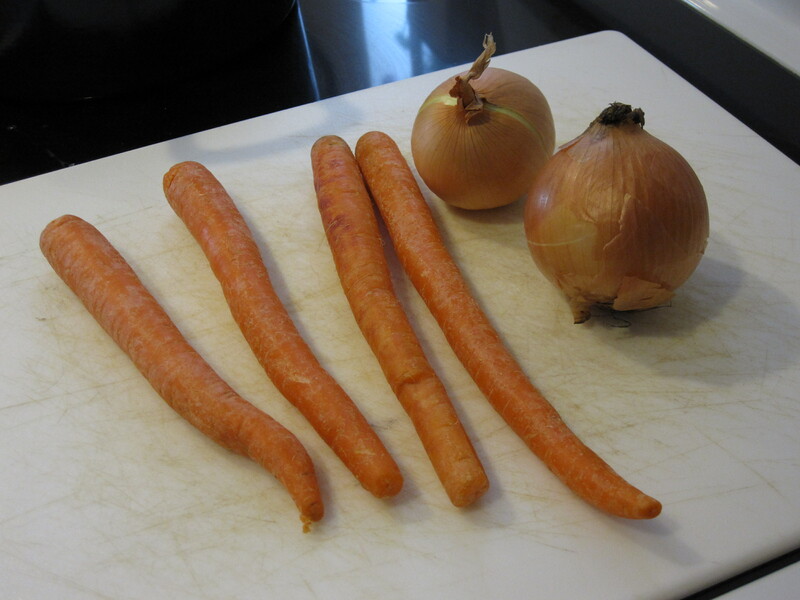 While the onion/carrot/garlic mixture sauteed I also added some spices: salt, pepper, Italian seasoning blend, and red pepper flakes. I put the lid on and put the pot into a 300 degree oven for about two hours. 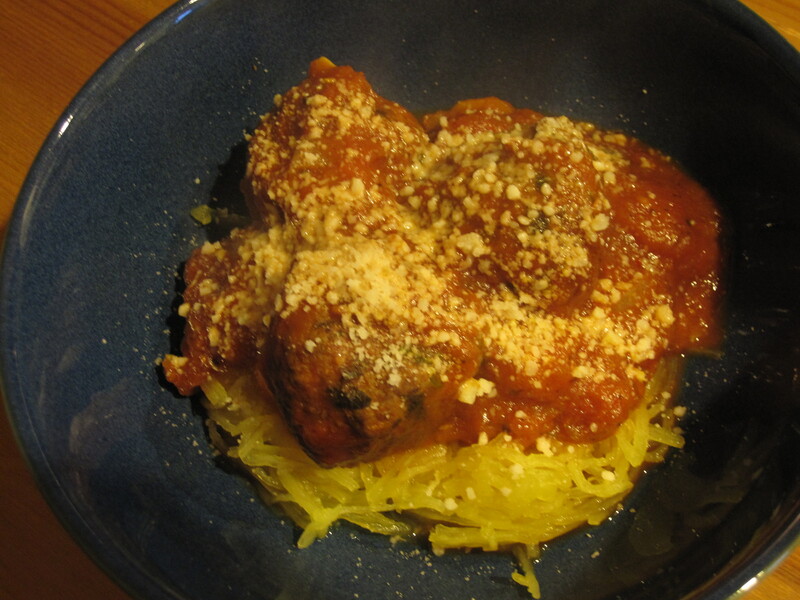 During that time, I also made my spaghetti squash and the meatballs. Two things I love very dearly at this point! After the two hours had passed (stirring about every 1/2 hour or so) I turned the heat down to 200 degrees and let the sauce continue to simmer. 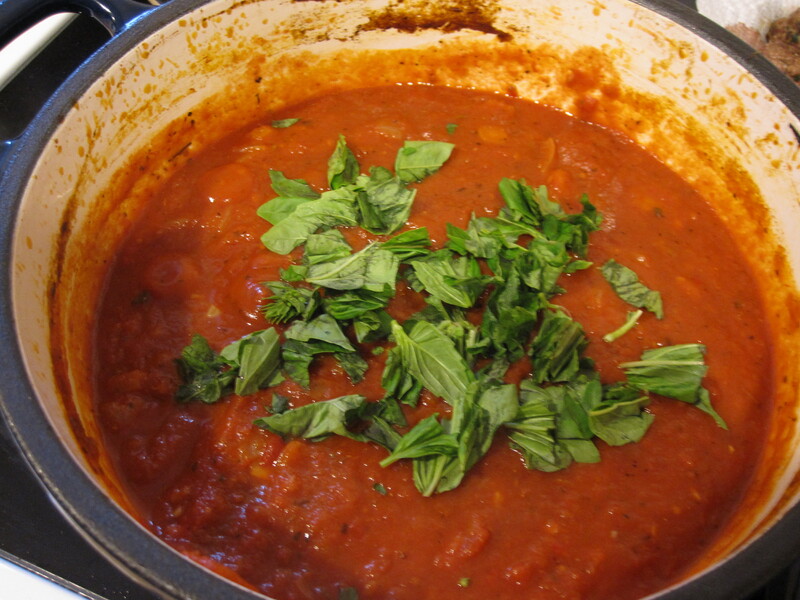 When it was nearly done and I was ready to add my mostly cooked meatballs, I added some freshly torn basil. 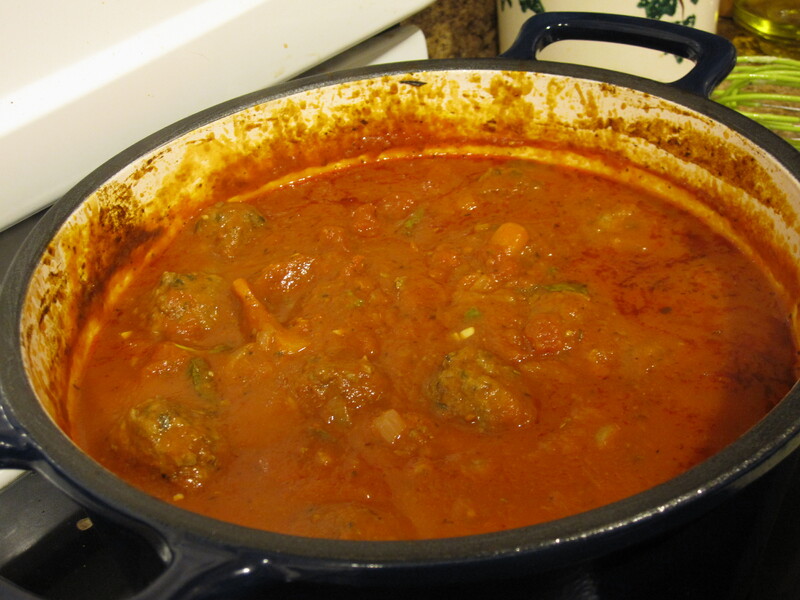 In went the meatballs and the sauce returned to the oven for another 1/2 hour. 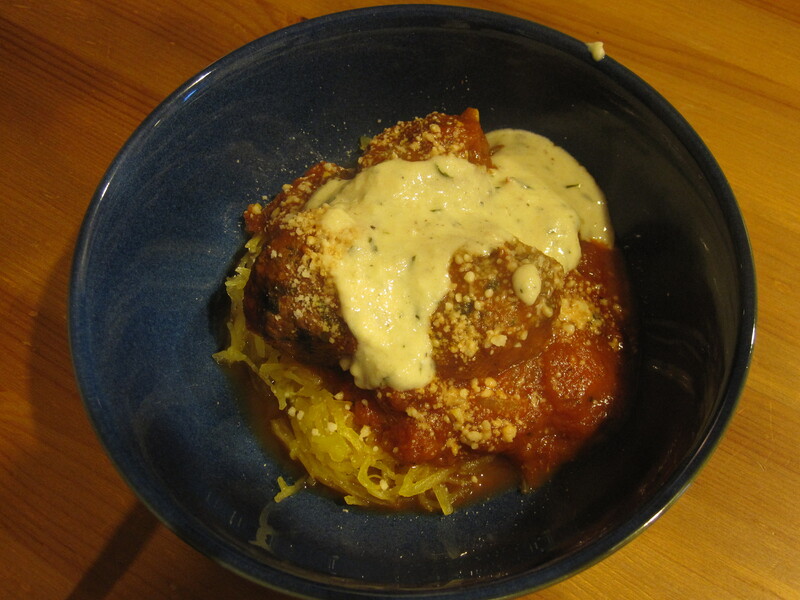 You can see how the addition of the meatballs dilutes the sauce a bit, but in a good way! 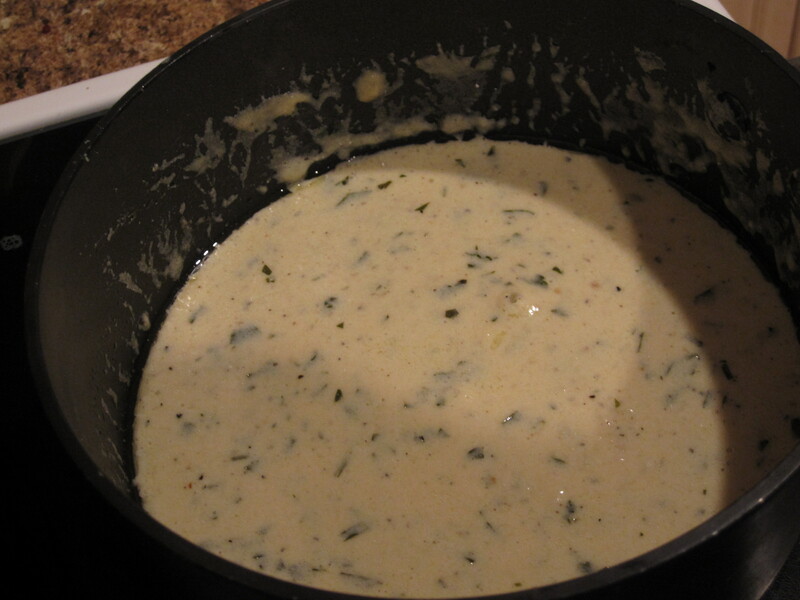 Greg also wanted to make an alfredo sauce for this meal. He used our previous recipe for this sauce, but added some fresh parsley and used only one type of cheese, parmesan, I believe. With or without the alfredo this meal was awesome and it was nice to make my own Sunday gravy. It’s nice to have options too and a little of the alfredo sauce can go a long way. Greg likened the combo to a rose sauce. The cool thing about making our own sauce was that there was a good amount leftover. I threw it in a tupperware and into the freezer for another meal at a later time. If you have the time, this is the way to go! 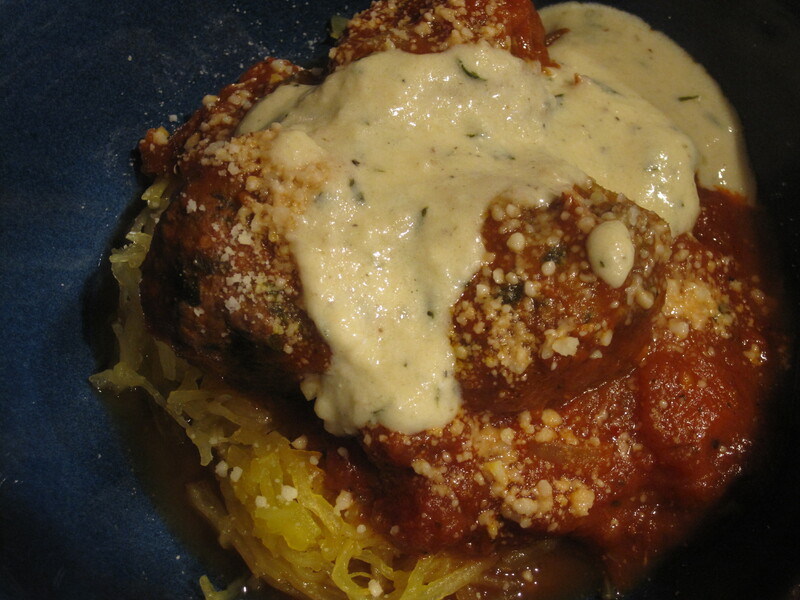 This entry was posted in Beef, Recipes and tagged alfredo sauce, basil, Beef, homemade, Italian, low carb, marinara sauce, parsely, spaghetti squash, tomato sauce. Bookmark the permalink.